Imagine grandmothers and grandfathers playing bingo and watching their soaps in nursing home designed to care for them. Under the surface of this placid image lies unchecked crimes that exist in geriatric care industry. This rarely discussed problem is all too common in modern day America the very people paid to care for our society’s most vulnerable. When considering the option of placing a loved one in a nursing home, many families expect that their elders will be properly cared for when they can no longer support them. 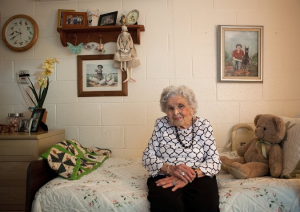 They choose to believe nursing homes are more capable of caring for their family members and have them offered clean, safe, and healthy living spaces as well as access to amenities and care that senior citizens require. Many facilities offer all of these things with well trained staff members who truly care and protect their clients. However, this is not always the case, as many workers abuse and neglect the very people they are supposed to care for. As previously mentioned, this isn’t always the case, however we must still acknowledge that this is a problem in the United States that must be dealt with and discussed. A problem that has become systematic is nursing homes that abuse their residents, and a lack of accountability from management and government officials yields little to no punishment for these transgressions. Th is is a serious problem, not just due to the disgusting nature of the acts but its prevalence in America. In fact, a congressional report found that over 30% of nursing homes in the US were cited for physical abuse violations causing harm between January 1999 and January 2001 and over 2500 of these violations were serious enough to cause real harm and to place residents in immediate danger of death or serious injury. To elaborate on the fact that the perpetrators often go without punishment, many government officials paid to oversee these nursing homes and those in power at the nursing homes are often willfully negligent or crippled by the fact that often patients can’t identify the perpetrator or fully remember the event. Nursing homes are slow to even start investigating and police often didn’t even try due to the failing memories of these people. Often, officials tend to dismiss these claims as hallucinations or fantasies. Nursing homes also try to avoid court by placing in arbitration clauses in their contracts which protects them from ever being sent to courts to solve their problems and forcing the people related to the victim to settle this very illegal abuse of power outside of where it is meant to be dealt with which is within the justice system. These systematic struggles are what often gives those affected by this abuse a harder time to get justice, and the perpetrators an even easier way to get away with their heinous crimes. Sexual abuse is just as ignored as physical abuse by the assisted living system. Many people incapable of even doing basic actions such as opening doors are raped by the people meant to care for them. These innocent people are often not able to consent, often due to a physical disability and the fact that their caregivers are in a position of power over them, physically and socially. Even in many situations in which there is photographic evidence, the perpetrators are not always arrested. For example, a group of male nurses in a nursing home in California humiliated a group of five residents, one which had cerebral palsy and was forced to walk around naked, another who was paralyzed and sexually harassed while forced to eat his own feces. While the nurses had lost their certifications after this incident, the organization Disability Rights California investigated and found that none of these nurses were arrested for their actions. Despite all these claims, there has never been a fully comprehensive study on the claims of sexual and physical abuse in nursing homes. Though both sexual and physical assault aren’t present in all nursing homes, it still exists to varying calibers and shouldn’t be ignored and it’s victims should not be denied a voice. Though many employees will try to expose abusers in nursing homes, it is often covered up by the homes themselves. Since employees usually aren’t trained to detect sexual abuse, they can never bring these up to authorities. Since nursing homes also rely a lot on their reputation, they avoid anything that would tarnish it. Not only that, but an investigation can cause the exposure of other issues in the nursing homes many of which can cause expensive lawsuits which may cause the nursing home to close its doors. In the end, this is a systematic problem due to the disbelief of resident’s claims and the negligence of government workers, nursing home managers, and local police forces which in the end just intensifies the problem as predators will view these vulnerable people as even easier prey and know they will walk free in the end. Without legislation that holds those who commit these crimes accountable this problem will never be solved and people will continue to be hurt without justice.